You may have seen it looking like this. Relaxation 101: The perfect place to start your care journey, Relaxation 101 helps you identify the reasons behind your anxiety and tension, providing the perfect environment and guidance you need to enter a therapeutic state of total calm, focus, and relaxation. 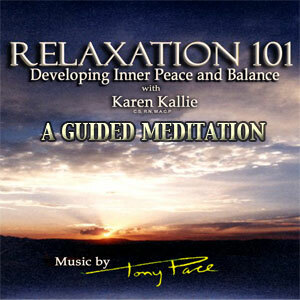 The strong meditative and healing properties of Relaxation 101 have been a key resource for thousands of people around the world. The music an d dialogue have been derived from decades of research and tangible results, working in concert to focus and intensify the sensory and emotional experience. Track 1 provides critical information and prepares your mind in a uniquely soothing and focused way; Track 2 builds on the foundation of Track 1 to transport you to a place that fosters the deep healing process of free form meditation. 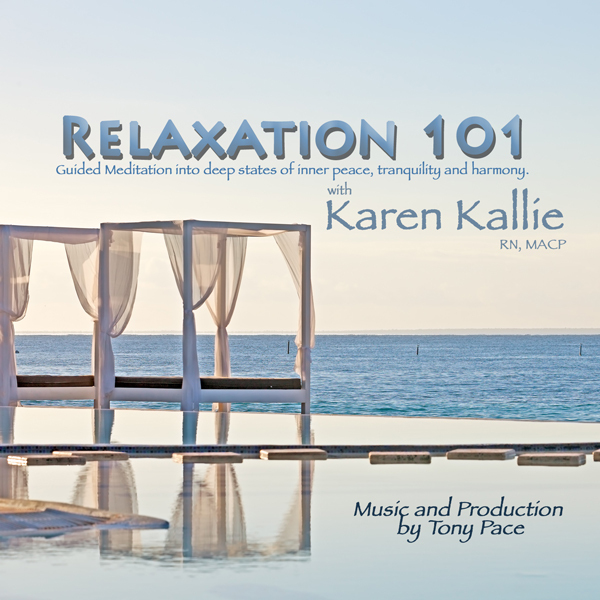 Relaxation 101 was developed and is presented by Karen Kallie, who is practicing Nurse-Psychotherapist with advanced training in Mind-Body Medicine and Energy Psychology. The music was also specifically written with instrumentation and tonal qualities to enhance your experience and work.